One thing I miss now that my children are getting older is cuddling and enjoying a good board book together. I use to enjoy introducing language to them, their excitement of me reading to them and their little bitty fingers turning the thick board pages. That was always so much fun for them. Another thing I miss about that are the adorable stories that were contained inside of those board books. The babies are cute, the animals are cute and the books are usually “everything baby” just like the new board book story Baby Baby!, which is written by Diane Stortz. If a baby has ever been a part of your life, you may remember them being amazed at everything about themselves. From their feet to the toes on those feet, to their baby giggles and baby kisses. Everything they see and everything they are able to do is just so amazing and new to them. Stortz captures all of the new discoveries in Baby Baby! through rhyming and a whole lot of busy babies. Before you open the book and begin reading, babies can enjoy looking at themselves in the mirror that appears on the cover of the book. Baby Baby! is a “mirror book”, so babies are not only able to watch what other babies do, they are able to watch themselves do whatever it is babies do. Some of the activities you and your baby will enjoy while reading through the book are watching babies “wave, crawl, reaching, drinking, cuddling, winking and smiling.” Illustrations by Ailie Busby introduce your child to a number of babies and your baby just may see one who reminds them of themselves. You may make reading through the book even more exciting by having your baby do some of the actions, mentioned in the book, on their own. They will be amazed at their abilities. Before you turn to the last page Stortz reminds your baby that they are “loved by God. The story finishes with a larger mirror that is framed with the words “Who does God love? God loves (insert your baby’s name) and a Bible verse. Jeremiah 41:3b “I have loved you with an everlasting love.” God loves everything about us from the time we were babies. Baby Baby! is now available for purchase for $7.99. Guess what? Homeschool Roster has a copy of the Baby, Baby! book for you to win. When you hear “it’s all in the name,” that statement is one that holds very true for Live on Forever, which is the title of the latest CD released by The Afters. The compilation of songs is one that came together over two years and out of the ashes of tragedy. ” Just as the band regrouped to record, Havens witnessed the wife of a close friend contract cancer. Drummer Jordan Mohilowski (who produced the new album) had a brief health scare, and a close companion in his church—part of the worship team—was hit and killed by an impaired driver. She was a young woman, Havens says, who had unlimited potential. 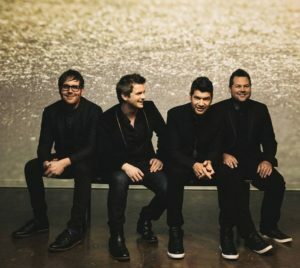 The Afters, a Christian rock band, has been entertaining audiences for more than 15 years. It has been a little over three years since they released their last album. Live Forever is the bands sixth album since in inception in 1999. Drummer Jordan Mohilowski; bass guitarist Dan Ostebo; vocalist and guitarist Matt Fuqua and lead vocalist and guitarist Joshua Havens, return and bring the good music their fans remember. If you are a fan of The Afters, you will be pleased with Live on Forever. If you are new to their music, it is a nice introduction. What fans get from Live on Forever is an album of hope, inspiration and a reminder that God is always by our sides through the good and the bad; through it all. The Bible is a big book. If you ask any child, they may tell you the same. Despite its size, it contains a story that must be told and one every child should hear. 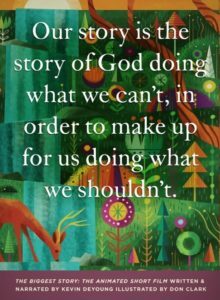 Author Kevin DeYoung has written The Biggest Story – How the Snake Crusher Brings Us Back to the Garden, which brings the Word of God to life for children. DeYoung is a father of six children, so he has an idea of what appeals to them and will capture their attention. His book, The Biggest Story, takes readers through the Bible from Genesis through Revelation with a focus on God’s grace and redemption. Now the contents of that book is available in an audio book format as well as an animated short film. Both formats provide parents (and grandparents) just another way to easily share the Word of God with their children. It is one you will also enjoy watching and listening to as DeYoung’s original story is presented. DeYoung takes the almost 70 books of the Bible and puts them into a short story form. It is like an overview of the entire Bible. Without delving too deep into each book in the Bible, the animated film tells the stories in just 10 short chapters that run from two to three minutes long. The audio CD also covers the same 10 chapters. The addition of both the audio CD and the short film add a new dimension to the story. I was excited by the images of vivid colors that are presented in the animated short. 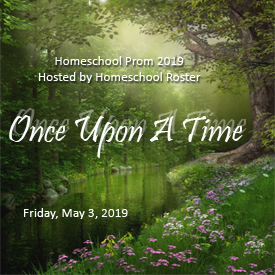 This presentation will allow your non-reader as well as reader to enjoy the story that is narrated by DeYoung. You may see a snippet from the animated film. My children enjoyed watching the animated film. When it comes to books for children, they have the best illustrations. Don Clark’s images are just as wonderful on screen as I am sure they are in the book. They are more than just accents on the screen. They are mesmerizing as well as entertaining and compliment the story. The Biggest Story audio CD and animated film short are two items that will enhance your Bible time together with your children. Author Kevin DeYoung, an America Christian Reformed Evangelical theologian, is senior pastor of University Reformed Church in East Lansing, Michigan and husband to Trisha. There is a lot to say about a book that has been able to remain significant for more than 160 years. That is what “All Things Bright and Beautiful” written by Cecil Frances Alexander has managed to do, but it may have more to do with the song that is detailed in the story. Or, it could also have something to do with the beautiful illustrations that have always accompanied the book. Artist and illustrator Katy Hudson has taken the familiar and memorable hymn by Alexander that has become a mainstay in the religious sector, and has given the lyrics of the song a new life. Hudson, raised in Middlesbrough, England, began displaying her artistic talent at a very early age. AS an adult, she later earned a degree in illustration and now works fulltime as a freelance illustrator. “All Things Bright and Beautiful” is just one of the many hymns that was written by Cecil Frances Alexander, who was also a poet. Alexander, born in 1818 in Ireland, passed away in 1895, and managed to write hundreds of hymns and poems. “All Things Bright and Beautiful” along with “Once in Royal David’s City” and “There is a Green Hill Far Away” are included in Hymns for Little Children, which was published in 1848. Hudson uses three characters, two little girls and one little boy, who walk the reader through the story and across beautiful landscapes as they take in the wonder of God and all He has created in nature. While the adults prepare the camp ground, the children enjoy the day out picking flowers and berries, blowing dandelion, watching birds fly and more. God has created much. “All Things Bright and Beautiful” is a nice read to share with your child (ages four to seven years old) while also introducing them to a hymn that they may one day hear and sing in church or Sunday school. Katy Hudson has given a boost to Cecil Frances Alexander’s hymn remaining a popular and well-loved hymn for another 160 years. 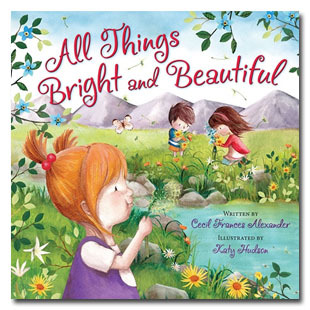 Price: “All Things Bright and Beautiful” is available for $13.59. The one thing I always enjoy about books written for young children is the amount of imagination and sometimes silliness you can enjoy through the story. Such is that with Would a Worm Go on a Walk? . The title itself is something, as an adult, you would probably never consider. For a child, the question is a logical one and worth flipping through the pages to find the answer. Author Hannah C. Hall has written a story that is colorfully illustrated by Bill Bolton. It starts with the original question about worms. The question is answered and readers move to the next question of whether or not “Would a Piglet play piano?” that is followed by a number of other silly, but fun questions your child will enjoy. I always wondered if a “possum would like to polka”, haven’t you? Hall brings her story to an end reminding readers that God has a purpose for everything He created, which includes worms, lions, penguins and more. We are all unique in our own way. Would a Worm Go on a Walk? is a great story to enjoy with your toddler to early elementary age child (four to seven years old) as a read-aloud or as an independent one by your reader. There is a lot of opportunity for call and response (“Would a…?) as well as for children to learn the characteristics of the many animals included in the story. Would a Worm Go on a Walk? 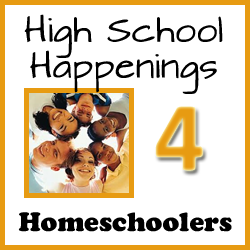 is a fun one and you may even find your older children sitting around just to share the read. Hannah C. Hall is the wife of a worship pastor and the mother of four children. Hall is a best-selling author of other children’s books that include God Bless You and Good Night and God Bless Our Christmas. You may read more about Hannah C. Hall. You may purchase Would a Worm Go on a Walk? now for $12.79. Guess what? 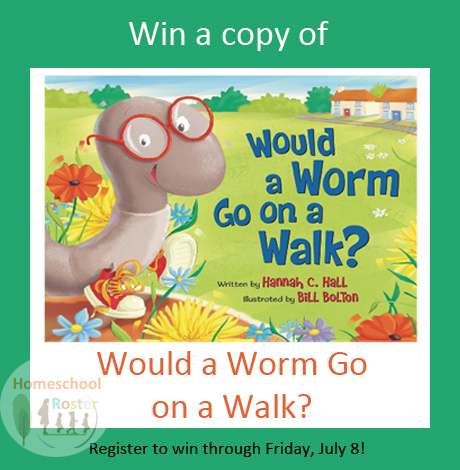 Homeschool Roster has a copy of Would a Worm Go on a Walk? to give away to one of its readers. Hmm. Could that person be you? Register below to win! Joaquin Fernandez and The Gunn Brothers released IndoctriNation: Public Schools and the Decline of Christianity in America in 2011 and the movie continues to have a profound effect on families around the world. 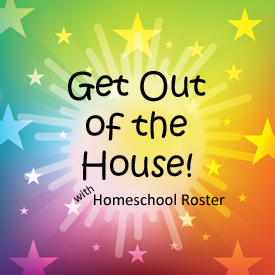 Although the film could be deemed pro-homeschooling, I found it to be more about children and the influences presented to them every day as they are shuttled off to school, away from home, in a big yellow school bus. If you have not yet seen the movie, it is available now to view for free online through Thursday, December 31. You may also purchase the DVD. At the time the move was made, Gunn purchased a big yellow school bus, which is a universally recognized symbol of public school, and drove across the United States with his wife (Emily) and their seven children. During this period, the Gunns interviewed a number of people – administrators, former students, parents, teachers and theologians. The audience is not presented a glossed perspective of the public school system, but instead the reality of it and what it has become over the years. 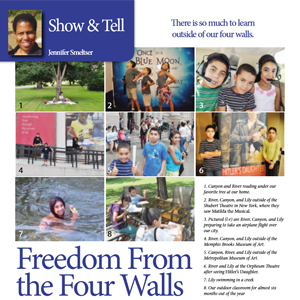 Students are not just presented reading, writing and math anymore while at school, but also must manage through many social issues like sexual sin, abortion, drugs and alcohol and violence while being forced to leave their Christian values at the school door. IndoctriNation presents great perspective on a heated subject that may always be a point of contention for Christian parents. This is a wonderful film to show for a group discussion with your family, but I would highly suggest it be for a more mature audience due to the nature of some of the issues presented in the movie. Prescreen the movie before sharing with your children.